BOSTON Both explosive devices used in the Boston Marathon attack appears to have been placed in metal pressure cookers packed with nails and ball bearings designed to amplify the damage from the explosions, CBS News correspondent Bob Orr reports. The details on the explosives emerged as the chief FBI agent in Boston made a public appeal for any tips to help identify suspects. At a news conference late Tuesday afternoon in Boston, FBI Special Agent in Charge, Richard Deslauriers, indicated that the range of suspect and motive is "wide open," and that the investigation is still in its "infancy." He also mentioned that the FBI had received about 2,000 tips as of noon as agents looked for any photographic or video evidence from witnesses. Deslauriers also said that both explosive devices appears to have been placed in a black nylon bag or backpack. A law enforcement source told CBS News senior investigative producer Pat Milton that investigators also found pieces of an electronic circuit board possibly indicating a timer was used in the detonation of the bomb. Orr reports that investigators have now recovered pieces of the backpacks and the pressure cookers; however, at the moment, the FBI does not know how the bombs were triggered. A law enforcement official told CBS News that the two bombs that exploded were made to look like discarded property. It is still unknown if one or both bombs were in garbage cans. One may have been on the sidewalk. The bombs were described as "low explosive," but with "anti-personnel" packing. The official said there were apparently things like BB's, ball bearings and nails in the bombs. This is consistent with doctors reporting shrapnel pulled from victims. A doctor treating the wounded said one of the victims was maimed by what looked like ball bearings or BBs. Doctors also said they removed a host of sharp objects from the victims, including nails that were sticking out of one little girl's body. Law enforcement sources told CBS News' Milton that a Saudi Arabian man who was being questioned by investigators is not being considered a suspect at this time, and it appears that he was a spectator who was injured in the attack. At the White House, meanwhile, President Barack Obama, who is to travel to Boston Thursday for an interfaith service for the bombing victims, said that the bombings were an act of terrorism but that investigators do not know if they were carried out by an international organization, a domestic group or a "malevolent individual." Obama: "The American people refuse to be terrorized"
The two bombs blew up about 10 seconds and around 100 yards apart Monday near the finish line of the 26.2-mile race, tearing off limbs, knocking people off their feet and leaving the streets stained with blood and strewn with broken glass. The dead included an 8-year-old boy and a 29-year-old woman. "We will go to the ends of the Earth to identify the subject or subjects who are responsible for this despicable crime, and we will do everything we can to bring them to justice," DesLauriers said earlier in the day. Dr. Stephen Epstein of the emergency medicine department at Beth Israel Deaconess Medical Center said he saw an X-ray of one victim's leg that had "what appears to be small, uniform, round objects throughout it  similar in the appearance to BBs." 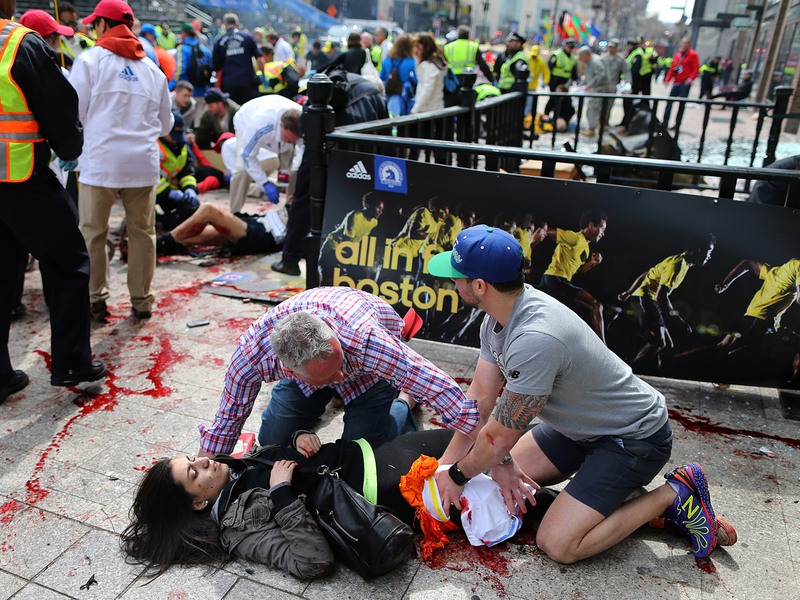 Dr. Richard Wolfe, chief of Emergency Medicine at Beth Israel Deaconess Medical Center, told CBS News Tuesday that the injuries sustained in the bombing have been primarily shrapnel injuries in the lower extremities. "Some hand injuries, but mainly devastating injuries to limbs," Wolfe said. "We have at least two amputations and a number of very serious wounds that require fairly aggressive care." Also killed was Krystle Campbell, a 29-year-old restaurant manager from Medford, Mass., who had gone with her best friend to take a picture of the friend's boyfriend crossing the finish line on Monday afternoon. A very emotional Patty Campbell told reporters about Krystle: "Everybody who knew her loved her. She had a heart of gold. She was always smiling and friendly. You couldn't ask for a better daughter. This doesn't make any sense." A graduate student at Boston University is also one of the fatalities in Monday's attack, the school's president, Robert Brown, announced on Facebook, while another student was injured and being treated at Boston Medical Center. "We cannot at present release the names of the victims," said Brown. "I can tell you that the injured student is in stable condition. Our hearts and thoughts go out to the family and friends of both victims." On late Tuesday, the Chinese Consulate confirmed that the deceased is a Chinese citizen. "At the request of her family, the victim's personal information will not be disclosed. Another Chinese citizen is among the injured and is in stable condition now after surgery," said the consulate in a statement. About 23,000 runners participated in this year's Boston Marathon. Nearly two-thirds of them had crossed the finish line by the time the bombs exploded, but thousands more were still completing the course. Demi Clark, a runner from North Carolina who said she was the crossing finish line as the first blast went off, told CBSNews.com "blood was everywhere instantly." Davis, the police commissioner, said authorities had received "no specific intelligence that anything was going to happen" at the race. On Tuesday, he said that two security sweeps of the route had been conducted beforehand.